At the 2018 U.S. Army Small Arms Championship – also known as the All Army – the National Guard proved that the marksmanship of Guard members is right on target. 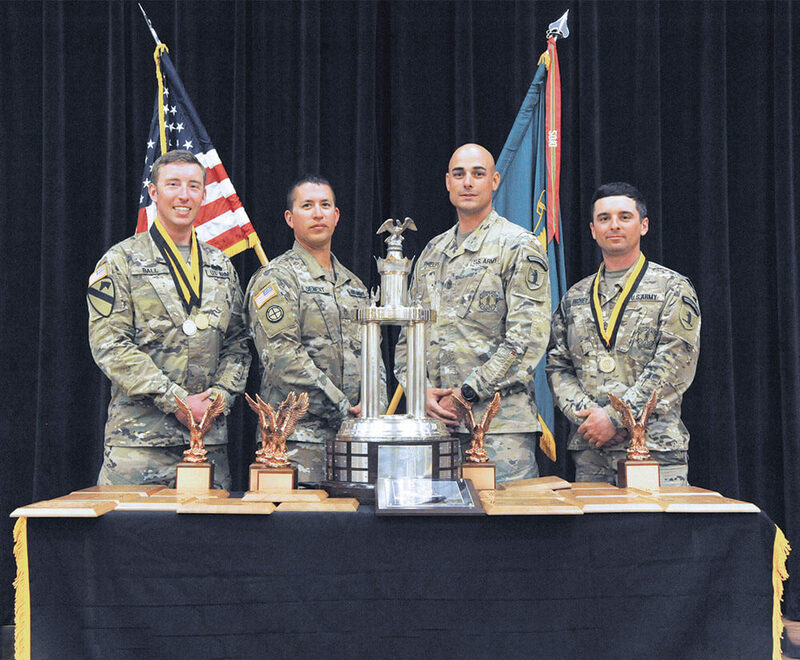 National Guard members brought home 19 winning titles across all eight All Army categories – including the championship titles in both the team and individual categories. Hosted by the U.S. Army Marksmanship Unit (USAMU), the Small Arms Championship is a comprehensive live-fire training event held at Fort Benning, Georgia. From March 11–17, more than 200 Soldiers were tested on their ability to problem-solve and think critically while employing both primary and secondary weapons systems. SGT Justus Densmore, Texas Army National Guard, engages a target during the Multi-gun Match at the 2018 U.S. Army Small Arms Championships March 11–17, 2018, at Fort Benning, Ga. In this year’s event, 11 National Guard teams competed to challenge 26 active duty and Reserve teams. Six of the 11 Guard teams were victorious and placed in the top three of their competition categories. The Soldiers of the Missouri Army National Guard team seized first place and were named U.S. Army Small Arms Team Champions, after taking first place in the pistol team competition and second place in both the multi-gun and rifle team categories. The winning team was made up of SSG Michael Richey, 1SG James Phelps, SGT David Ball and SSG Jerry Dement. With the highest aggregate score from all individual matches, SGT Justus Densmore of the Texas Army National Guard’s 551st Multi Role Bridge Company earned the title of U.S. Army Small Arms Overall Individual Champion. 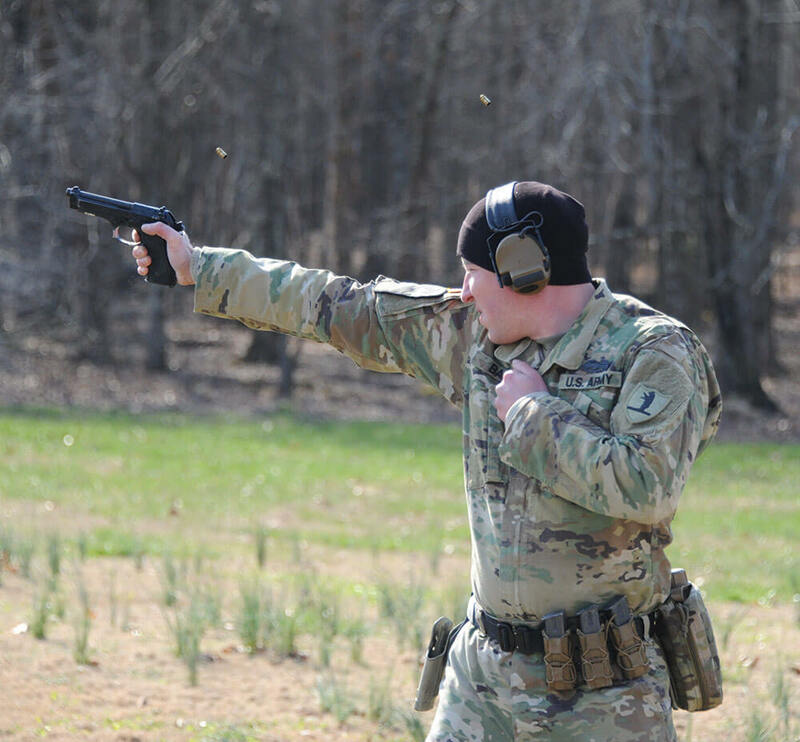 SGT David Ball, Missouri Army National Guard, practices the service pistol style shooting while engaging paper targets with his M9 pistol during a trainup for the U.S. Army Small Arms Championships. 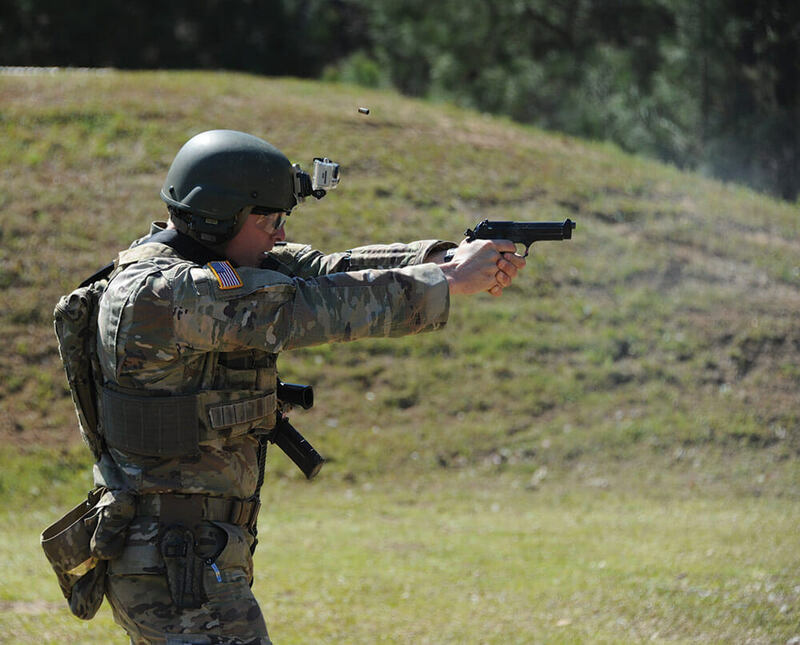 The Small Arms Championship began with training from USAMU coaches, instructors and competitive shooters who conducted a rifle and pistol Small Arms Firing School (SAFS) for all participants in the championship competition. During the championship, Soldiers competed in multiple events, both as individuals and as four-person teams, to test diverse levels of marksmanship. Once the competitive matches began, USAMU held clinics after each match as refresher courses on the fundamentals of marksmanship. While the in-competition training was certainly helpful, the members of the National Guard teams came prepared and had trained hard before ever setting foot on Fort Benning. They participated in a week-long training session in Tennessee prior to the Small Arms event. 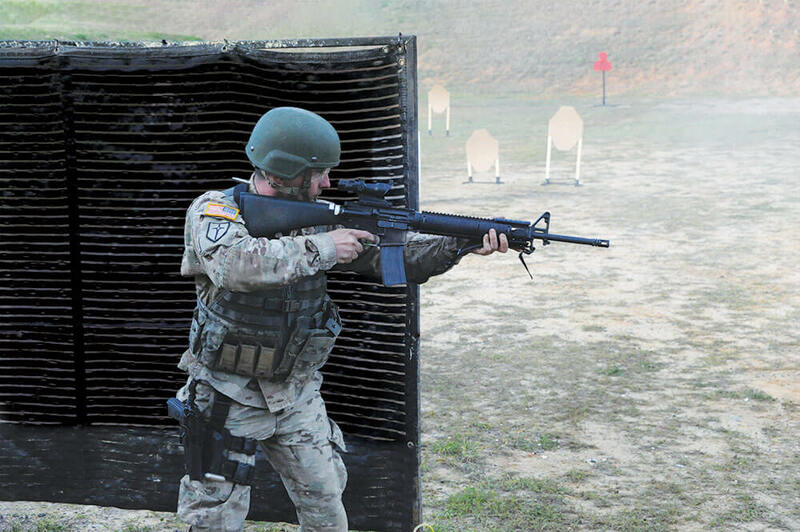 SSG Michael Richey, Missouri Army National Guard, engages targets with an M16A2 rifle during the Multi-gun Match at the 2018 U.S. Army Small Arms Championships March 11–17, 2018, at Fort Benning, Ga.
Also serving as the Competitive Events Coordinator for the State of Missouri, SSG Richey knew his team was prepared to perform well. 1SG Phelps also expressed a feeling of confidence upon entering the competition. With a wide range of Soldiers entering the competition, all with unique backgrounds and techniques, the championship fostered an environment of collaboration and a sharing of knowledge. This willingness to share knowledge ties into the overarching mission of the Small Arms Championship, which is to advance marksmanship across the Army. While the winning Guard members were most certainly proud of their achievements at All Army, they were also quick to emphasize the importance of focusing on the lessons learned, rather than the scores ranked. The winning Missouri National Guard team poses with their 2018 Overall Small Arms Team Champion trophies. Left to right: SGT David Ball, SSG Jerry Dement, 1SG James Phelps, SSG Michael Richey. “In my mind, it’s not about how we perform,” 1SG Phelps explained. “Performance is important, but it’s more about what we learn from the competitions to take back and use to enhance our Soldiers’ abilities. The Soldiers also noted how the support of the NGMTC contributed to their preparedness for this event and for future competitions. “All Guard teams owe a big thanks to the National Guard Marksmanship Training Center,” said SGT Densmore. “NGMTC conducts marksmanship competitions to develop competitors into trainers who translate this knowledge and experience into training that is used back at our home stations. Soldiers interested in attending training courses at the NGMTC or in participating in one of the training competitions, should contact the center by phone at 501-212-4420 or by email at ng.ar.ararng.mbx.ngmtc@mail.mil. MG Timothy McKeithen, CW5 Bryan and husband Stephen Bryan.